The station that used to be KMPH is now on the air from San Francisco. 50,000 watts day and night, directional. 3 towers day at 38-09-33N/122-24-44W. 4 towers night at 37-35-34N/121-46-27W. A permit has been granted for a new station. 10,000 watts nighttime, directional, four towers. An application has been filed for a new station. 25,000 watts daytime, directional, 3 towers. The Canadian Radio-Television and Telecommunications Commission has revised its policy on digital radio. In 1995, an initial policy was established. Spectrum at L-band (1452-1492MHz) was assigned. Digital Radio Broadcasting (DRB) was established primarily as a replacement service for existing analog AM & FM stations - but provisions were made for authorizing new digital-only stations as well. The first license was issued in 1998. Since then, 57 commercial DRB stations and 18 CBC stations have been authorized. The 76th authorized DRB station, in Toronto, is a digital-only ethnic outlet. The Commission is very concerned about the stalled DRB transition. Roughly 15 of the 76 authorized stations (including the digital-only operation in Toronto) are not on the air. Some stations that once operated have since ceased operations. Few recievers have been sold, and there is no interest in expanding DRB service beyond the six cities where it exists. Since DRB transmitters have only been built in the largest cities, motorists travelling between Quebec and Windsor, between Calgary and Edmonton, or between Vancouver and south-central British Columbia lose DRB reception. As a result, automakers have switched their support from terrestrial DRB to XM/Sirius satellite radio. - How can radio best transition from analog to digital, and how can the Commission help? - Should the Commission cease to consider DRB as a replacement technology? - Should new digital-only stations be encouraged? - Should other technologies besides Eureka 147 be considered? - If we give up on DRB, what should be done with the spectrum? - iBiquity claimed that "...the technology is compatible with the current broadcast infrastructure and therefore enables the reuse of frequency spectrum as well as some of the existing equipment." They also claimed their system provides other public benefits through multicasting. - The Ontario Independent Radio Group "...recommended that Canadian stations wishing to adopt IBOC technology should be able to do so without a prolonged regulatory process..."
The Commission says it's up to the station to decide whether any IBOC self-interference is enough to discourage adoption. However, they do not accept interference to other stations. "...the Commission has concluded that, if the aforementioned issues can be addressed, particularly any potential interference to other stations, the use of IBOC technology,... could be considered for licensing." To a large degree the decision of whether to authorize IBOC is not the Commission's - it lies with the Department of Communications. The Commission says "...if the Department authorized IBOC technology for the AM and/or FM bands under the Radiocommunication Act, the Commission would be prepared to authorize services..."
The Commission has announced it will hold a round table in six months, with the CEOs of the major radio groups, to discuss further plans for DRB implementation. A permit has been issued for a new station. Permittee is IHR Educational, a Catholic religious broadcaster. The daytime site is just west of Green Bay, and the night site just south of the city - both facilities should more-or-less cover Green Bay. Glenn Hauser found this link that may shed some light on the 590/1020/1610 test situation. Required to complete full scale transmitter and associated equipment testing. Company is a govt contractor which is developing mobile broadcasting units which can be deployed worldwide in order to satisfy customers immediate military requirements. Broadcast operation encompasses use of AM band frequencies which are necessary to simulate overseas operating parameters. This STA, however, expired in November 2005. (and note that it specified 1600KHz instead of 1610) It sure does look a lot like what we've been hearing though. This is an Office of Engineering & Technology STA. STAs for operation in the broadcast bands are now handled by the Media Bureau; however, this is a relatively recent change. (I believe OET STAs were legal for broadcast frequencies in 2005) This may be why there has been no information from the Media Bureau: it's quite possible they aren't aware of this STA! IHR Educational (a Catholic religious organization) has applied for a new station here. Distributed (TV) Transmission System in Penna. Transmission System (DTS) for their digital operation on channel 25. All eight transmitters are considered co-equal by the FCC. #3: 110w/116m 39-33-42/75-55-48 S of North East, Md. with any future changes in the rules. Monitoring Times Magazine is offering a limited-time discount on subscriptions to MT Express online. MT Express is a .pdf electronic version of the monthly printed magazine. You get everything that's in the printed magazine - but as an added benefit, pictures that are in black-and-white in the printed magazine are in color, and the Web links are active - you don't have to type them in on your browser. A one-year subscription to MT Express is ordinarily $19.95. If you order by the end of the year (December 31st) and mention this American Bandscan blog, you can subscribe for only $14.95. This special is valid both for new subscribers and renewals. But you must order by December 31st and you must mention this blog. See the MT Express website for more details. Application filed for new station here, 1670KHz, 1kw ND. Programming in French for children and teenagers. Gatineau is across the river from Ottawa. CHHA-1610 will be signing off temporarily effective tomorrow. Due to interference they've been ordered to stop transmitting from their current site. They've already found a new site on the Toronto lakefront and will return to the air when they can complete construction there. An application has been filed for a new station in Nogales. Many DXers are reporting a VERY strong test signal on 1610KHz last night. It broadcast only a 1KHz tone... and was heard coast-to-coast. At 0800 CST, it's still audible (but just barely) here near Nashville and by Neil Kazaross near Chicago. Direction finding and fade characteristics suggest a location on the Eastern Seaboard generally between Philadelphia and Raleigh. If you hear this station as local reception please let me know. An application has been filed for a new station here. The same reports indicate that in a separate action, the company will be selling 448 small-market radio stations and their 42 TV stations. The test will begin at midnight Mountain time (2am Eastern time) and run until 2am Mountain (4am Eastern) Saturday night, November 18th - technically Sunday morning in most of North America. On KERR-750 the test will run from 12:05am-1:58am Mountain time. Please put "Montana DX Test" in the subject line. Include an audio recording (mp3 etc.) if possible, the stations would like to know what they sound like at a distance. Thanks to Kevin Redding & The ABDX E-Mail List, Ron Huckey, Michael Richard, Steve Dow, Todd Clark, Tony Mulligan, Les Rayburn, and the staffs of these stations! Montana is a tough logging east of the Rockies; this is likely to be the best chance in most of our lifetimes to log this state! An application has been filed for a new station on 1340KHz. Power will be 10kw fulltime, non-directional with a single tower at 19-31-13N, 155-55-04W. If approved this would be the only U.S. station on a local channel (1230/1240/1340/1400/1450/1490) to run more than 1kw power. KZTS-1230, Sunnyside, granted frequency change from 1210. Power to decrease from 10,000 watts day, 1,000 night to 700 watts fulltime. Station will remain non-directional. WSQR-1560 Sycamore, Ill. has moved to 1180. With the move comes a significant increase in daytime power from 198 watts to 900. Nighttime power actually decreases from 18 watts to one. However, on 1560 WSQR was only allowed to use that 18 watts from sunset in Bakersfield, Cal. (where dominant station KNZR is). Between Sycamore sunset and Bakersfield sunset WSQR was limited to 2.3 watts. The lower dial position will also improve coverage considerably. WSQR will remain non-directional both day and night. KKAG-740, Fargo has been reported testing. 50,000 watts day; 7,500 watts critical hours; 940 watts night, three different patterns. Pattern favors the west with a sublobe to the south at night and to the northeast during the day. 1370, 2,500/5,000 watts DA-2. 3 towers at 41-22-38N/71-39-50W. 1400, 1,000 watts ND from a single tower at 29-47-30N/101-30-30W. KHCH-1400 Huntsville, Texas has moved to 1410. Power is decreased from 1000 watts fulltime to 250 watts day, 87 watts night. I presume this is to accomodate KHCB-1400's planned move to League City. Four Montana stations have scheduled a simultaneous DX Test on the early morning of Sunday, Novebmer 19th. The test will run from midnight to 2am, Mountain Time. Brampton, Ontario: application for new station, 1650KHz, 1,000/680 watts ND, ethnic. Mutually exclusive with Mississauga application. Mississauga, Ontario: application for new station, 1650KHz, 1,000 watts ND, ethnic. Mutually exclusive with Brampton application. Montreal, Quebec: application for new station, 1400KHz, 1,000 watts ND, ethnic. KENT-1400 Parowan, Utah has filed for a license-to-cover. This new station is at 37-48-22N, 112-56-40W and runs 1kw non-directional fulltime. Call letters have been assigned for two of the new stations recently reported in this blog. 670 in Essex Junction, Vermont is now WVVT. 1590 in Kearsarge, Penna. is now WCXJ. I've added a link on the right to Brandon Jordan's "DXtests.info" blog. This blog lists all current NRC/IRCA DX tests. His site also explains just what a DX test is. The FCC has approved a new AM station in Jackson, Wyoming. The station will operate on 1450KHz with 1,000 watts fulltime, nondirectional. It'll have a single tower at 43-27-45N/110-47-37W. Permittee is Bott Communications, a religious broadcasting chain. HD standalone table radio. Radio Magazine reports that suggested retail on the HDT-1 tuner is $299. I would guess the price on the HDR-1 table radio might be slightly higher, probably around $349. How close to MSRP will Universal's price be? Good question. The Radio Magazine report also mentions a car adaptor (which converts HD radio to analog for reception over the existing car radio) with a MSRP of $199, and another table radio for $249. A DX test has been announced for the night of November 5th, 2006 over WWNH-1340 Madbury, New Hampshire. The test will run from 10pm until 2am, Eastern Time, and will include frequent IDs, some in Morse Code. A self-addressed, stamped envelope is required for a response. 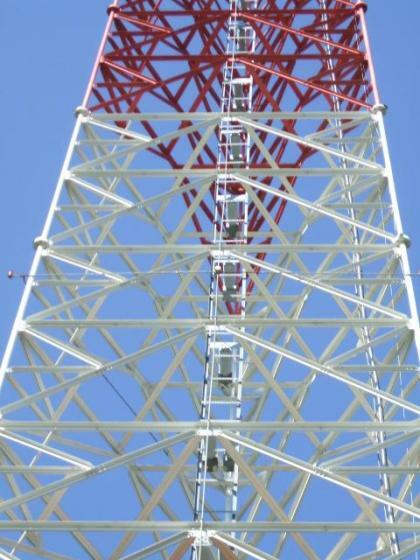 The FCC has approved the application of KHCB-1400 Galveston, Texas to move to League City. This is officially a "major change" (I think because of the change in city of license) but in fact it will have little effect on DX. KPCR-1530 Bowling Green, Missouri has moved to Illinois. The station, now WLIQ, Quincy, has filed for a license-to-cover. 1,400 watts daytime, 290 watts critical hours (2 hours prior to sunset), non-directional. Reportedly relaying KHMO-1070 Hannibal, Mo. New AM station in Penna. 1590 in Kearsarge, Pa. granted by FCC. 500 watts day, 900 watts night, DA-2. 1340 in Steamboat Springs, Colorado. 1,000 watts full-time, non-directional, single tower at 29-47-30N/101-30-30W. 1400 in Langtry, Texas. 1,000 watts full-time, non-directional, single tower at 29-47-30N/101-30-30W. CKDO-1580 Oshawa, Ontario has announced a special "DX Program"
Saul Chernos reports the program will run from 9pm Eastern time, Thursday, October 5th (0100 Oct. 6th UTC) to 2am Eastern time Friday, October 6th. (0600 UTC) This date is precisely coincident with the 60th anniversary of CKDO's 1946 debut. The broadcast will be with the station's normal 10,000-watt directional signal. CKDO uses the same facilities day and night, there is no more powerful daytime pattern to use for the test. Their pattern favors the east and west - it should be easily heard in New England and the Midwest. This program is in honor of CKDO's recent frequency change to 1580KHz. CKDO originally signed on on 1240KHz, and operated on 1350 for over 50 years. CBJ (Chicoutimi, Quebec) moved from 1580 to 93.7 FM in 1999, opening 1580 for use elsewhere in Canada; CKDO was the lucky winner(grin). 1100 in Albert Lea, Minnesota. 850/230 DA-2 from a five-tower array at 43-36-06N/93-22-32W. WKGC-1480 Panama City Beach, Florida. Granted move to Southport, Florida, 30-17-45N/85-39-42W. Daytime power to increase from 500 watts to 5,000. Nighttime power to decrease from 78 watts to 34 watts. KMER-950 Kemmerer, Wyoming has moved to 940. They've also decreased daytime power from 5,000 watts to 250 and increased nighttime power from 90 watts to 150. 1340 in Huntley, Montana. This is just east of Billings. 250 watts full-time, non-directional with a relatively short (17m/56') tower at 45-54-18N/108-16-17W. Permittee is IHR Educational Broadcasting, a Catholic broadcasting organization. 1400 in Tonopah, Nevada. 1,000 watts full-time, non-directional with a single 58.8m/193' tower at 38-02-54N/117-14-27W. I found a (partial) list of 1926 radio stations in a 1926 copy of QST magazine. Can you match the station with its frequency (as it was in 1926, not today!) and its city? The frequencies are pretty hard. Many of the cities are easy, many are hard, many are trick questions. This last one hurts, it's a 50kw non-directional and probably the easiest way to log the Maritimes from outside New England. I believe I figured out what wasn't working with comments - they should be working properly now. 670KHz in Essex Junction, Vermont. 1450KHz in Battle Mountain, Nevada. Applicant is IHR Educational, operators of a number of Catholic religious stations in California and adjoining areas. WISS-1090 in Berlin, Wis. near Oshkosh has moved to 1100 and doubled power from 500 watts to 1,000. A "new" AM station is on the air in the Philadelphia suburbs. WFYL-1180 is being reported with talk programs. The city of license is King of Prussia, Pennsylvania, near Philadelphia. WFYL is 420 watts, daytime only, non-directional. It is for all intents and purposes a new station, though technically it's a frequency change and city move for the former 1530 station in McConnellsburg, Penna. The FCC is opening a filing window for a new expanded-band station on 1700KHz in Rockland Co., New York. During the recent filing window for major changes, WRCR, Spring Valley, New York filed an application to move from 1300KHz to 1700. The station claims it's precluded from upgrading on its current frequency by other stations on 1300. It also claims that improved coverage (especially at night) is necessary to provide emergency information to people living in the evacuation zone of the Indian Point Nuclear Power Plant. Commission staff initially denied WRCR's application; the major change window specifically stated expanded-band applications would not be accepted, and denied WRCR's petition for a waiver of that freeze. The full Commission has reversed the staff decision, and agreed to consider applications for a new expanded-band station on 1700KHz. However, they decided it would be unfair to simply grant the frequency to WRCR. Instead, a filing window will be opened. If more than one mutually-exclusive application is received (almost certain, IMHO) then an auction will be held to award the permit. Specify a city-of-license located in Rockland Co., New York. This proposal is possible only because WGIN-930 in New Hampshire never filed to use the 1700KHz expanded-band channel assigned to them in the original expanded-band allotments. Entercom has purchased WILD-FM 97.7 Brockton, Mass.. The urban station will become a relay of WAAF 107.3. WAAF, originally licensed to Worcester, has been trying to get a better signal into Boston proper and other eastern parts of the market, but an attempt to move the transmitter 10 miles to the east failed with disappointing coverage. DXer Saul Chernos is reporting IBOC on the CBC's CBLA-FM 99.1 Toronto. Canada currently authorizes Eureka 147 digital radio. However, uptake of digital radio north of the border has been disappointing. (in fact, it's been disappointing everywhere, except Britain. The CRTC has opened a proceeding to consider whether the U.S. IBOC (HD Radio) system should be authorized in Canada. It is common practice for CBC stations to experiment with technical changes before the CRTC considers whether to allow routine use of these technologies. One must wonder if IBOC could be a train wreck in Canada. Use of third-adjacents is common in large Canadian cities, and even second-adjacents are not unusual. Below are some FCC & CRTC applications & actions for AM stations in the U.S. and Canada. changes are listed - these consist of changes in frequency and/or city-of-license. changing the city-of-license, do not appear. DA3: directional day & night, different patterns; uses a third pattern during "critical hours"
Rumor has it the FCC's Consolidated Database System (CDBS) used to track technical parameters of domestic broadcast stations has been having problems for the last week. In fact, trying to pull up the CDBS right now (Wednesday afternoon) confirms that, returning a page indicating a hardware failure has occurred. They promise recovery tomorrow - good luck!